Place chicken breasts in your slow cooker. In a mixing bowl combine barbecue sauce, brown sugar, tequila, Italian dressing and hot sauce. Stir until combined. Pour the sauce over chicken. Cover and cook 5 hours on LOW or 3 hours on HIGH. Remove chicken from slow cooker. Shred chicken using 2 forks. Return chicken to slow cooker; mix and heat with sauce before serving. Preheat oven to 400°F. Line a rimmed sheet pan with parchment paper and spray generously with non-stick cooking spray. 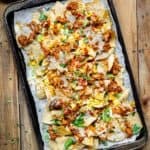 Spread tortilla chips in a single layer on the prepared sheet pan. Sprinkle with 1 cup of cheese, corn, fresh salsa, green onions, and shredded tequila barbecue chicken. Then sprinkle the the rest of the cheese all over the toppings. Bake nachos for 10-15 minutes, or until cheese is melted. Remove from oven. Garnish with cilantro leaves. Serve with guacamole and/or sour cream, if desired.